Swedish football icon and former Man UTD star Zlatan Ibrahimovic has announced his intention to join forces with the BetHard team to help them enable their vision. The firm is celebrating this event by offering €100 betting bonus to all new players! 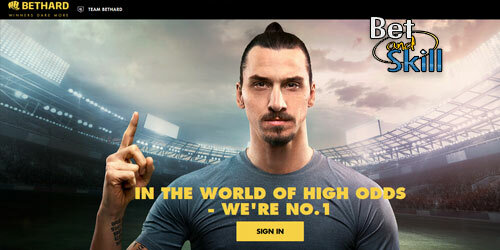 Former Manchester United star striker Zlatan Ibrahimovic is the new Brand Ambassador of BetHard.com sportsbook. The partnership official launch was initially postponed over fears it could breach English Football Association (FA) rules. Players, along with managers, coaches, match officials and club employees, are prohibited from betting on matches, transfers, managerial appointments, team selection or disciplinary matters. But Zlatan has now moved to LA Galaxy in the USA Major League Soccer and the Swede is no longer bounded by FA rules introduced three-and-a-half years ago. “We have taken a bold decision to start building a next-generation sports betting brand and we are of course super excited to welcome Zlatan onboard. What better companion could we possibly have on this journey?” said Erik Skarp, co-founder, and CEO of Bethard Group. Zlatan Ibrahimovic said ”I have obviously been intensively courted by online bookmakers throughout my career, but up until now I have not been presented to anything that has triggered me. With Bethard, there was something different. It’s a company with Swedish roots, the founders are from my home town and they are true challengers who really wants to do things differently”. To celebrate this great news, BetHard, which aims to become Europe’s leading sports betting site, is offering all BetAndSkill readers a €100 welcome bonus! Founded in 2012, BetHard is an iGaming company that offers sports betting and casino games online. Company headquarters is based in St Julians, Malta. Bethard.com operates out of Malta and is currently licensed in Malta and in the United Kingdom. As part of a massive growth plan in the next few years, the company is actively seeking licenses in a number of European markets and expects to be an important player in most key European markets already by 2020. "BetHard announces Zlatan Ibrahimovic as brand ambassador"